San Diego is otherwise known as America’s finest city. Home to sand, sea and surf, visitors flock to this special city 365 days a year in search of sun, scenic vistas and adventure. Some come for the hiking and the craft beer scene. Others come for the lessons found amidst the architecture, the lore of a city’s beginning and the possibilities of ghost stories. All three of those are rolled into one at the William Heath Davis House. Known today as the Gaslamp Museum at the Davis-Horton House, this historic space is located in the historic Gaslamp Quarter of downtown San Diego. The sixteen-and-a-half block nationally recognized area of the city is home to many shops and restaurants and runs perpendicular to the Martin Luther King, Jr. path, the Convention Center and San Diego Bay. Residents and visitors alike can take tours (given by the Gaslamp Quarter Historical Foundation) of the Davis-Horton House. 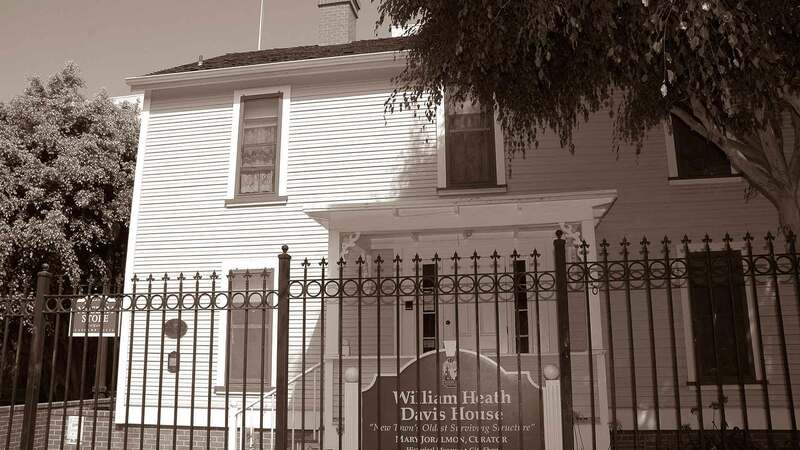 The foundation’s mission is to ‘preserve architecture, culture and history of the Gaslamp Quarter’ and showcasing the exhibits and programs at the Davis-House is part of their efforts to maintain that heritage. William Heath Davis was the first person to attempt to build what is today known as downtown San Diego. It was 1850 when he decided to buy a shipment of eight east coast ‘saltbox’ style homes and have them shipped around Cape Horn to San Diego Bay. Mr. and Mrs. Alonzo Horton arrived in San Diego in 1867 hoping to pick up the pieces of the failures of Mr. Davis. Horton and his wife moved into the house while awaiting the building of their mansion. Entering into the real estate business, Mr. Horton orchestrated the first real estate ‘boom’ that took place in San Diego, California. Today, the Davis-Horton House is the only place left in San Diego where Alonzo Horton lived. Although the house itself moved three times, it has been in its present day location since 1984. The Davis-Horton House is on the National Registry of Historic Places. The Victorian era home is today a museum offering house tours 6 days out of the week, they are closed on Mondays. Each room represents a different period and a different function in the home. Offering a self-guided tour that takes visitors through time, this oldest surviving wooden structure in San Diego showcases life lived in San Diego’s past. Once used as a makeshift hospital and a pre-Civil War military officer’s barracks, the house has been a part of major events in both local and national history. All tours begin at the Davis Horton House (walk-ins welcome). School and private tours also available. Ghost tours are some of the most popular tours at the Davis-Horton House. For ghost tours and those searching for tours depicting a paranormal path, visitors are encouraged to make reservations in advance. Learn about the paranormal past and ghostly haunts of the present. Tour takes guests through the ghoulish haunts including brothels, saloons, funeral parlors and the hauntings at the Davis-Horton House. Fridays at 5 p.m. Tour length: 90 minutes. Pricing (subject to change): $20 adults; $15 seniors and active military; $10 students; free ages 7 and under. On this tour visitors can examine, study and inspect paranormal events and activities at the house. These are the events that fall outside of the parameters of normal and are difficult to explain. A professional team of paranormal researchers leads this tour. Guests under 18 must be accompanied by an adult. Tour is not appropriate for children under 12. Many visit spots in San Diego to hear of the hauntings of the past and the ghosts of the present. Rumored to be haunted by the ‘colorful’ souls who once lived here, the Davis-Horton House is high on the list of ghost tours and ghoulish finds. In its heyday, the house was home to various individuals with a plethora of interesting pasts. The building was a makeshift hospital for approximately ten years, an officer’s quarter before the Civil War and it even had an alleged World War II German spy in hiding who was captured at a later date. With documented cases of ghostly wanderings, the Davis-Horton spot is one to put on your list. There have been reports of lights flickering even before electricity was running through the house when lamps had to be lit by a match and even after the house was wired for electric. Still today, random lights are found on after the museum staff has turned them off. Ropes placed on the tops of doorways at closing time have been found off doorway hooks in the morning. A Victorian woman has been seen (from the waist down in long petticoat and shoes) in the house near the child’s room at the top of the stairs. A medicine chest that is left open by museum staff has been found closed and items are found shifted inside when staff come in the morning. Visitors have mentioned feeling a foreboding presence surrounding the chest. Items on a table set for four have been moved at night by random forces.